Young male screaming into microphone. Recently, these two areas have intersected in the conversation about the growing scarcity of Millennials working in government. At 75.4 million, we are now the largest generation in the U.S., and will continue to hold that status for decades to come. Brookings estimates that by 2025, Millennials will make up 75 percent of the U.S. workforce. With many Boomers slated to retire soon, there’s concern that governments will not be able to attract and keep enough talented Millennials to fill the void. A quick Google search will turn up a host of pessimistic headlines: Some have questioned the studies underlying these attitudes. A 2015 Deloitte report argues, for example, that when you control for age of entry into the workforce, Millennials have lower turnover rates in government than those of Gen Xer’s. But no matter how you look at the statistical analyses, the question remains: how can we attract top talent from this generation to work in the public sector in the coming years? I studied public policy analysis and politics in college, and subsequently completed the Coro Fellowship in Public Affairs—a leadership training program that exposed me to professionals and working environments in government, business, labor unions, media, nonprofits, and electoral politics. This experience enlightened me, perhaps more than many people my age, to the wide variety of ways I could make a social impact. Having now started my career at a government technology company, I feel the weight of choosing between career paths in different sectors both personally and societally. I am confident that at least some portion of my career path will include public sector work, and I’m excited by that prospect. However, I’m hard-pressed to find many of my friends—even those who studied public policy or politics—who share the same feelings. Why? I would argue, more than anything, we have a problem of perception. At first, it may seem like public sector culture and that of the Millennial generation are at odds. The former represents a slow, sometimes archaic, institution, while the latter is hallmarked by rapidly evolving technology and social networks. Yet, under the surface, there’s a shared fundamental desire to be of service. Surveys on Millennials’ workplace attitudes have shown they consistently rank social impact and sense of meaning in their work over individual and organizational reputation. Source: “How the Recession Shaped Millennial and Hiring Manager Attitudes about Millennials’ Future Careers.” Career Advisory Board (Levit and Licina), 2011, USA. Survey of 1,023 U.S. adults. They still care about getting paid, but an emphasis on work-life balance over career progression suggests that money is not the overwhelmingly defining factor. In keeping with many progressive ideas around employment (6-hour work day, work to live, early-retirement, the “end of work”), Millennials attitudes about what work means in the scheme of our individual lives and of society are changing. They don’t necessarily want one career to define them, they want to enjoy their personal lives, and they want the work they do to be meaningful. Source: “The 2016 Deloitte Millennial Survey.” Deloitte, 2016. Survey of 7,770 Millennials in 29 countries. So we have a generation of tech-driven, entrepreneurial, trendy innovators who are challenging workplace norms and who are concerned about their social impact on the world. At the same time we have thousands of governments in need of young leaders, many of whom can help navigate the transition to the technological world of the 21st century. How can we bridge the gap? There are few institutional barriers to hiring more Millennials in government. Some have argued that longer hiring times and job cuts are important factors. But the increasingly attractive private sector and familiar draw of nonprofits seem to be the insurmountable problem. Why work in government when you could pursue social entrepreneurship or work on the ground in the philanthropic area of your choice? So how do we make the public sector, already crippled by ingrained stereotypes, more attractive to this generation? Yes, embracing modern work practices like remote working and non-traditional benefits is important. Survey data has shown that Millennials care deeply about work-life balance, along with professional development in the form of mentorship and educational opportunities. Investing in current technology is also a priority to attract those who’ve spent most of their adult lives on the internet. These are important steps. But they’re not enough. When someone believes in something, they’ll make sacrifices. When they don’t, they’ll overlook benefits. And there’s really no point in trying to outdo the workplace culture of San Francisco’s newest startup. We have to make Millennials realize that working for issues they care about could look different than what they’ve imagined. The beauty of this situation is that the pieces are there, the motivations are already aligned. The missing factor? Marketing. I don’t mean running more ads on the latest job openings. I mean marketing in its most powerful sense—the type that has the power to shift social norms. Social marketing campaigns are often used to tackle major public health challenges. The most famous and successful example being U.S. anti-tobacco campaigns, which have helped reduce smoking rates by turning our cultural attitude against smoking. Source: Centers for Disease Control and Prevention. Youth Risk Behavior Survey (1991-2013); National Health Interview Survey (1965-2014). Smoking will make you suffer. Smoking harms the people you love. These simple ideas were illustrated in creative advertising campaigns that helped bring U.S. smoking rates to their lowest points in history, and spurred nationwide legislation to protect people from secondhand smoke and curtail tobacco advertising. Here are a few ideas for a social marketing campaign to change the way Millennials think about working in government. Core messages should address existing concerns and barriers to Millennials pursuing public sector employment, while also nurturing new ideas about how they might perceive government. Remember, the specific words used in these examples are unimportant. The ideas themselves can be crafted and disseminated in any number of ways. Governments can sometimes seem exceedingly frustrating and slow. But have you imagined the alternative? [Insert name here] won the presidency and from day one was able to make unilateral decisions without the burden of political institutions. As a recent Vox article reminded me, we tend to think of history in the narrow context of our own lifetimes. We forget or don’t realize (especially Millennials) that in 1944 only 10 percent of the world’s population lived under a democratic government, compared to over 50 percent today. At the same time, poverty, literacy, and health measures around the world have all improved dramatically over this time period. Our institutions have helped us achieve this progress. In an era of instant gratification that accustoms us to instant results, we must remind Millennials that slow-moving institutions—particularly democratic governments—have been a foundation to bettering humanity. 2. Governments make persisting change. Do you want to make an app that will become obsolete within the next year, or struggle to bring people together around an important resolution that will affect your community for generations to come? If making a positive social impact in the world is important to Millennials, we should challenge their ideas about what kind of impact they want to make and where they can best do that. Governments have more power and resources than many of the organizations Millennials will consider working for. While these can be frustrating to allocate and manage (remember that thing about institutions? )—they will be used. Let’s encourage Millennials to be a part of deciding how that happens. 3. Governments are human, like you. Are you frustrated with the political process? Are you, perhaps for the first time in your life, afraid for the future of your country? You have the chance to engage in the some of the most important, difficult, and rewarding work of your generation. Governments are not faceless institutions. They are full of living, breathing people working to make their communities better. That’s a reality not often translated to Millennials, and to many people who don’t frequently interact with their governments. Like humans, governments are growing and changing with the rest of society. We need to send the message that young people are welcome there, and will be empowered to make change and solve the kinds of problems affecting the daily lives of their communities. Impactful core messaging is only one part the process. A successful social marketing campaign also requires that these messages reach their target audiences through the right channels. Here are three channels that could effectively target talented, educated Millennials, particularly those still questioning their career paths. The only recruiters with a strong presence at my college were high-profile consulting firms and Teach for America. I studied public policy analysis and still felt there were few resources offered to my classmates and I to learn more about public sector work. While significant numbers of college students and recent graduates will always be attracted to electoral politics and large federal agencies, they often don’t know enough about other public sector opportunities to even consider them. “Government” is a catch-all term that needs to be specified into career paths that relate to people’s skills and interests. Once Millennials learn what it means to be a City Manager or a Transportation Planner they can start to make concrete associations about what that job might actually look like. Partnerships with humanities departments, alumni associations, and career counseling offices would be a big step in the right direction. This whole time you might have been wondering how a social marketing campaign could achieve significant results without substantial funding. Luckily, we live in a digital age of social networks. 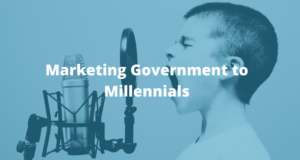 Not only is social media the marketing medium of choice for Millennials, it’s a free platform that can be used simultaneously across many government networks to make a collective impact. Teach for America (TFA) has long been a household name, in part because of a brilliant marketing strategy. TFA made themselves desirable by recruiting at Ivy Leagues and elite liberal arts schools, marketing the program as a service opportunity before launching students into another career path or attending graduate school. Regardless of what you think about the organization, they made themselves desirable to bright, ambitious Millennials. Code for America (CFA) has an interesting spin off this idea, connecting software coders to the government services in most need of technological improvements. I imagine a program for recent grads and young professionals, marketed like TFA and CFA, but focusing on local and state governance (possibly two different tracks). Participants would rotate between different areas of government, be paired with mentors, and could earn educational credits at the same time. They wouldn’t be scared off by committing themselves to this career path, but would get a firsthand look into the inner workings of local government to make more informed employment decisions. Much like TFA, even if many participants didn’t end up pursuing a career in the field, they would carry that knowledge and openness to collaborate with the public sector into their own fields of work. In today’s world, marketing hits us from every angle, and it takes sophisticated insight into your audiences to break through the noise. Here are a few techniques that would make a government-backed campaign targeting Millennials stand out. Storytelling. I love Engaging Local Government Leader’s Finding Local Government series. It targets our human instinct to listen to and remember stories, and it also puts a face to the concept of a “government employee.” Hearing and seeing the stories of typical Millennials enjoying their careers in local government challenges preconceived notions about what a “government job” means. Addressing fears and concerns. Effective social marketing campaigns pack a one-two punch, using their core messages to simultaneously promote new ideas while also addressing fears that prevent the desired behavior or attitude. For Millennials, these fears might be things like a perceived lack of growth or leadership opportunities in government positions. Research into the Millennial segment could provide insight into the most pressing of these concerns and how to address them. Humor. I might faint if I saw a truly funny social media post trying to get me to work in local government. Governments are lucky enough to have the bar set very low in this regard, so it wouldn’t take much to catch the attention of a young audience. Humor also provides the chance to display familiarity with Millennial culture (what are they going to find funny?) and poke fun at some of the cultural attitudes that might prevent them from considering government employment. This 2011 ad, produced by the New Zealand Land Transportation Safety Agency, employs humor to target young, Maori men who were at high-risk for drunk driving. The use of humor in public safety campaigns is somewhat controversial, but the results are undeniable. This video had an average unprompted recall of 50% in Year 1 (2012) and maintained high recall of around 30% in 2013 and 2014. Strikingly, in 2014, the number of young drivers caught over the limit was half the benchmark prior to the launch of the campaign. Changing perceptions is hard, but it’s possible. Consider this: in 1990 smoking was legal in hospitals in the United States. No one could have imagined that in 2017 we might have to stand 25 feet away from the door of a bar to smoke a cigarette. In 2017, we are worried that not enough talented Millennials want to work in government. There are a variety of relevant factors, but addressing Millennials’ perceptions of government as a barrier to public sector employment is key to tackling the challenge. With the historical success of social marketing campaigns, we’ve seen how messaging can change thoughts, feelings, and behaviors on a mass scale. With the power of the internet and social media, the energy motivated by political unrest, and the humanizing effect of storytelling and humor, I can imagine a 2025 where the next Millennial local government hire arrives after turning down a job offer from Google. A new generational workforce will always bring change. The question now is, given that we have the power to do so, how do we want to shape it?